The New Lion King Trailer Nails the Most Nostalgic Moments | Nerd Much? Disney dropped their first full The Lion King trailer today. Finally giving fans an in-depth look at how the live-action/CGI dynamic looks up close. And spoiling the entire damn movie in the process. We jest, of course, about the spoilers. If you don’t know the gist of The Lion King then you’re likely not caring much about the classic film’s upcoming live-cation remake. The new Lion King trailer brings a lot of the original movie’s iconic moments into a real world setting for us, exciting those leaning into the nostalgia factor. The new Lion King trailer kicks off a new take on Scar’s “life’s not fair, is it?” monologue from the animated movie. 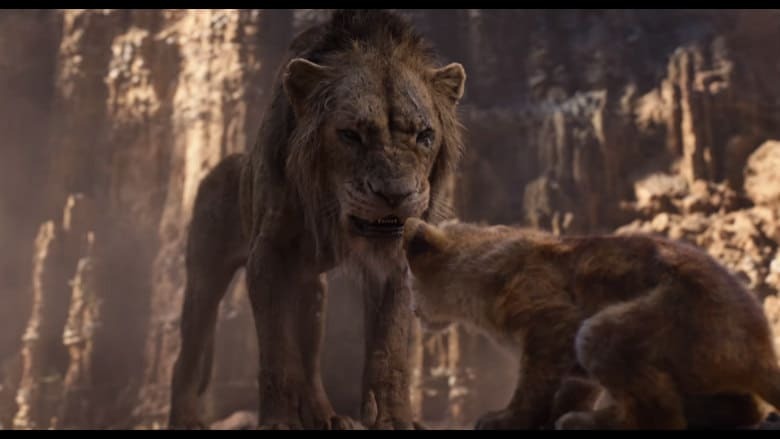 But this time, Chiwetel Ejiofor’s Scar appears to be giving a speech toward the film’s hyenas while the trailer sees Simba and Nala making their way toward the elephant graveyard. “While some are born to feast, others spend their lives in the dark. Begging for scraps,” Scar says as we’re seeing the hyenas emerge from the shadows causing the two young lions to cower. We then cut to Mufasa giving Simba the “Circle of Life” speech. During this time we get our first glimpse as John Oliver’s Zazu, without dialogue though. It’s worth point out at this point that the CGI is spectacular on these lions. Jon Favreau’s direction keeps their animations very lifelike. And even during dialogue facial motions are subtle yet effective. And I’ll be damned if the look on that little lion’s face doesn’t break your heart as he turns and runs. The trailer then takes us to Simba’s time in exile, as we see him gallivanting around with Timon and Pumbaa. And we see the young lion evolve into his adult form just as we did in animated 1994 feature. Shortly after, we see adult Simba and Nala, played by Beyoncé Knowles-Carter, reunite. The new Lion King trailer then wraps up with Simba’s return, and reclaiming, of the Pride Lands. We’ll likely get one more Lion King trailer ahead of the film’s July 19th release date. Outside of James Earl Jones’ iconic take on Mufasa once again, and Chiwetel Ejiofor voicing his brother Scar, there isn’t any other voice work to be heard in today’s footage. And with a cast as robust as this one’s, Disney will certainly want to show it off before the movie roars into theaters.